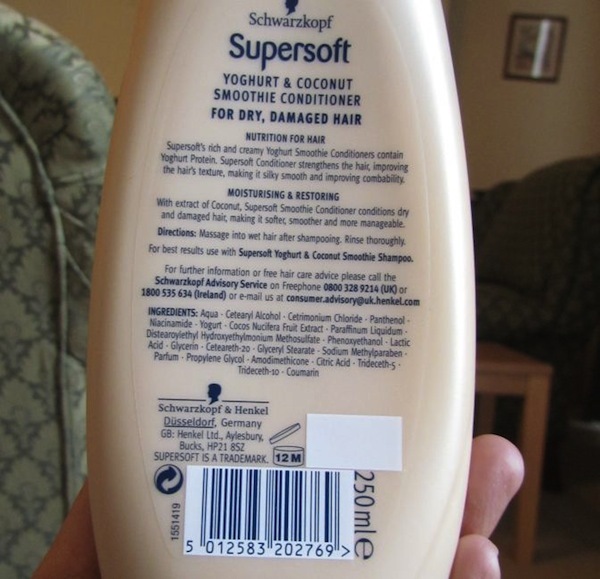 Schwarzkopf Supersoft Yogurt and coconut smoothie shampoo and conditioner. Choosing a right shampoo is I think the most difficult task during shopping. As you move into the market you face thousands of brands that are offering you a shampoo that will provide you the best solution for your hair problems, but seriously speaking most of them are useless and even cause hair damage. I have been facing the hair fall and split-end issue for many years and have tried many brands but most of them end up in vain. One day while I was searching for a shampoo in a nearby mart I come to know about Schwarzkopf. At first I didn't want to try it as I was really fed up but on the advice of sales girl over there I decided to give it a chance. I went through all the products and then finally decided to go for Supersoft Yogurt and coconut shampoo and conditioner. It deeply nourishes the hairs with yogurt and coconut proteins. It restores and moisturizes the dry and damaged hairs leaving them soft, smooth and shinier. 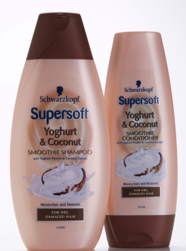 Schwarzkopf Supersoft Yogurt and coconut smoothie shampoo is available in 400ml bottle and the conditioner is available in a 250ml packaging. Its also available in combinations of yogurt with Red strawberries, Lime, Aloe Vera or Peach. Packing is average but don't go for the looks.. The smell is sharp but is quite good and if you are a coconut lover than you will definitely love it. You can use it as a normal shampoo but I use shampoo in a quite different way. I take a bowl with a little water in it, then dissolve a little quantity of shampoo in it. Beat the shampoo till a fine leather is formed then gently massage it onto your scalp. Leave it for few minutes and rinse. Repeat it if necessary. 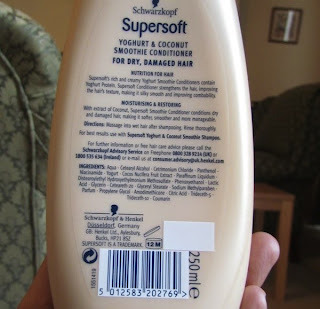 For best result apply Schwarzkopf Supersoft Yogurt and coconut smoothie conditioner on your hairs through out the ends avoiding the scalp. Leave for 5minutes and rinse with luke warm water. Before applying it my hairs were quite rough, frizzy and very difficult to deal with. I found it good after few wash. My hairs were very soft and manageable. It deeply nourished my hairs with its protein power. For best results use it frequently along with its conditioner. Schwarzkopf is a well renowned brand when it comes to choose a product for your hairs and its offering a wide range of products that is catering the need of everyone. The brand is good and right product can give you good results.